So I was down in New York for a short visit last night and today. For those who are unaware, today is Bunker Hill Day which is a state holiday in MA. Trivia question: Where was the Battle of Bunker Hill fought? The cabs have TV now. My cab from the airport seemed to have Channel 7, while the one to the Airport had Channel 4. The TVs have different features, but the end result is the same. If you're from out of town, you're all "Hey lookee here, there's a lady talking to me from the seatback in front of me." If you're a New Yorker, you're thinking that as you can't actually access the internet from the TV, that it's 80% useless. It also has a map that tells you where you are, which I suppose is so that cabbies don't take tourists for an extended ride. But the tourists would have to be geographers I fear. How the hell would I know whether I was taking the long route, unless I could see that I was in Jersey and I wanted to go to Queens. Dumb. LaGuardia is a poor airport. I know it was the first major airport we had in the city, but the central terminal is a poor design. It's almost as bad as Kansas City, but nothing could really be that bad. It needs an overhaul, but the airport is built on a postage stamp, so they really have nowhere to go. There are great views of Rikers though from the runway. I got to order a coffee this morning from one of these. If you don't know what this is, it's a coffee cart and they spring up all around midtown and in other areas predominately near subway stations. They are a unique New York fixture and of the ones I frequented I always had great times talking to the guys inside. Large coffee is still $1, which is a great deal. And my favorite is they know how to make a regular coffee. Regular for those not in the know is not black. That's called a black coffee. A regular in NYC is milk and 2 sugars. Regular in Boston is cream and 2 sugars. I hate cream in my coffee. It makes it way too viscous. I wish there were coffee carts everywhere. The battle of Bunker Hill was fought on Breed's Hill, as I recall. Steve, you are correct sir. Prize for you. I'll buy you a beer. was it fought on bunker hill? steve probably googled and is a big cheater. they have those coffee carts in philly but i haven't tried them yet. i concur with the coffee carts. there's nothing like it... and the coffee is soooo good. as are the cinnamon rolls. which are enormous. and also $1. and if the guy thinks your cute, you sometimes get 2 for 1. not that i'm saying i'm cute. it was likely more so because i was female. 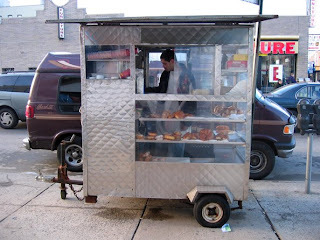 I miss coffee carts! I would patronize coffee carts for my breakfast of a roll and butter, which is almost impossible to find in the Boston area.